Modric, who attracted interest from Inter at the start of the season, said: "I have two years left and hopefully one more. "The club show me a lot of affection and I'd like to retire at Real Madrid. "My family enjoy it and I want to keep enjoying this huge club." 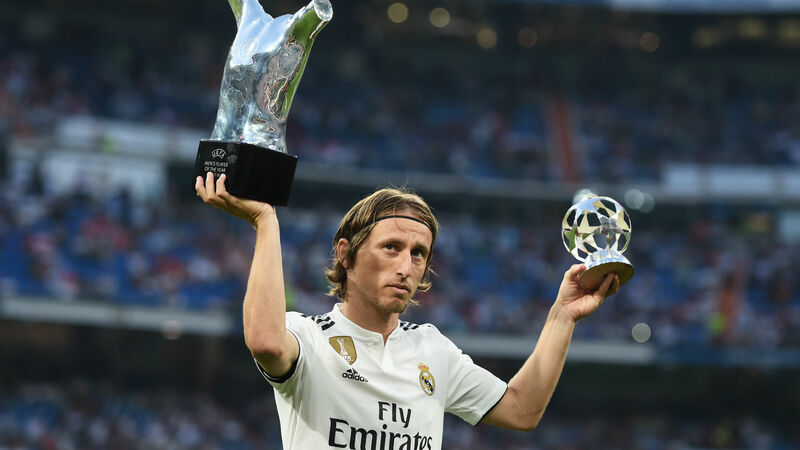 Modric capped a brilliant 2018 by edging five-time winner and former team-mate Ronaldo, who finished second, while Messi was fifth in the voting. The 33-year-old Modric – who was also named FIFA's Best Men's Player this year – helped Croatia to the World Cup final in Russia having guided Madrid to a third successive Champions League crown. Modric, however, admitted he would give up all his individual accolades – including the Ballon d'Or – to win the World Cup. "I said, I think last time when I won The Best, I would change all my individual awards for the World Cup, unfortunately it didn't happen," Modric told reporters. "This success we achieved at the World Cup for such a small country like Croatia is something amazing. "But, like I told you, I would change all of this for a World Cup. It didn't happen, this is a great feeling to win at least this, and very happy for it."